IRISH RAIL HAS postponed its plans to run Darts every 10 minutes due to what it described as the “intransigence” of unions. Siptu has denied that the issue is due to the union’s actions. The proposed 10-minute frequency for DART services had been planned to commence on 10 April. This is due to trade union intransigence on behalf of SIPTU and NBRU who represent DART drivers, who have refused to engage on normal timetable changes in response to changes in demand, and walked out of Workplace Relations Commission discussions on the issue. It described the trade unions as using “the requirements of our customers as a bargaining chip in pursuit of completely separate issues, citing productivity despite the company training additional drivers to deliver the service; and seeking pay increases of up to 25%”. “We reject the assertion that this is the fault of the trade unions, basically because the 10-minute Dart service has always been an integral part of productivity discussions”. He said that Irish Rail is”not in a position to introduce the 10-minute Dart service because the drivers will not be signed until June of this year”. He said Siptu members “are clearly saying we want to await the outcome of the productivity discussions which won’t happen until June”. The National Bus and Rail Union (NBRU)’s general secretary Dermot O’Leary said: ”Blaming Dart drivers and their trade unions is disingenuous in the extreme”. He said that the government has a responsibility to both passengers and staff to ensure the appropriate funding is in place to run the rail service. The NBRU has written to Irish Rail this morning to tell the company that “in absence of real dialogue on pay we will be left with no alternative but to accede to the clamour from our members to ballot for industrial action”. 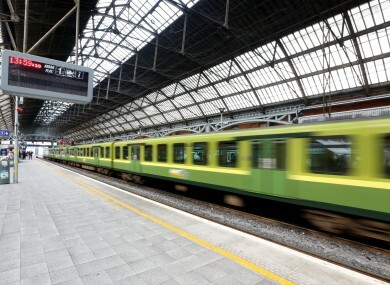 Irish Rail apologised to customers for the change, but said it will however increase train size on a range of peak DART services to address growth in passenger numbers. “From 10 April, we will deliver extra peak capacity for thousands of customers in both morning and evening peak,” it said in a statement. The company also said that the extra drivers who had been trained to allow the service to expand “will reduce the need for additional hours from drivers within the existing schedule”. It has trained one group of nine drivers and has another group in training. Existing services on DART, Drogheda/Dundalk Commuter, Maynooth/M3 Parkway Commuter, Sligo and Rosslare Europort lines will continue unchanged until further notice. There will be some minor changes to Belfast Enterprise services from 10 April. Email “Irish Rail postpones its plans for 10-minute Darts ”. Feedback on “Irish Rail postpones its plans for 10-minute Darts ”.